Something wonderful: a 2-day workshop on the essentials of freedom. 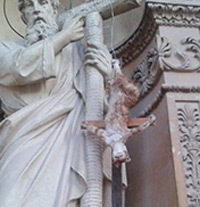 Something horrible: the crucifixion of a cat, the crucifixion of a dog. Something wonderful happened over the weekend, and something sickened me today. 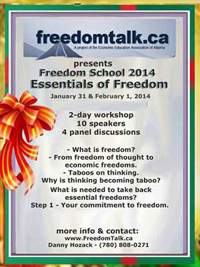 I will start with the wonderful thing - a 2-day workshop on The Essentials of Freedom. First up, Think or Sink, on the vital importance of being able to think - or you are stuck locked in your brain, unable to see what is happening, seeing danger where it isn't, and not seeing it where it is, distorting, denying. You may hold that all opinions, cultures and religions are equal despite massive evidence to the contrary. You may hold it's wrong to judge, that everything is relative and/or subjective, that everything happens for a reason and you are where you are meant to be - like being killed in a car crash by a drunk driver!! I was the speaker on that topic. It's a topic I'm passionate about. In fact it's good thinking that got me to pay attention to Islam. It just didn't make logical sense that millions of Muslims would march and rage and burn because of a little cartoon published in a small country thousands of miles from most of the marchers - when I didn't hear even the tiniest bit of upset expressed by Muslims about 10,000 Muslims murdered by Muslims in just one year in just one city, Baghdad. Anyway, back to the workshop. The focus: different aspects of freedom. Economic freedom. Democracy and freedom. Freedom from political correctness. Religious freedom when worlds collide. Which freedom is the priority and why? Freedom of speech? Freedom of physical danger? I care about animals, have done quite a bit of kitten rescue, for instance. I lived with a dog and a cat in childhood. I have pets now. The crucifixions of the cat and dog - not the only such crucifixions, by the way - sicken me. 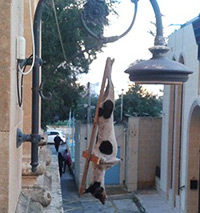 The perpetrators: those in Malta were almost certainly Muslims, as the crucifixions were done in earmarked Islamic territory. The crucifixion of the car in Nigeria was definitely done by Muslims. Also in my inbox, a photo from Sweden. 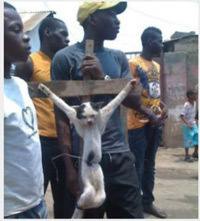 Underneath it, the words: Muslims in Sweden torture, skin and decapitate a cat. All the best to all of us who care and dare, who feel compassion and empathy for animals and people too. Thought, care, love - wonderful. lack of care and compassion - horrible. to a blog journal on good trust, click here. on the essentials of freedom. the crucifixion of a dog.